Well the move has happened. I am currently sitting in a bed at Duke no longer looking at the mountains but at dense lush forest. Yes folks Anna is back in the trees. 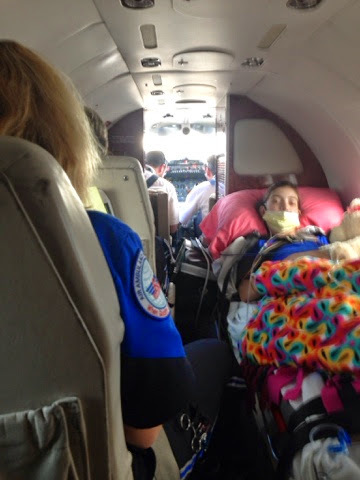 I was flown to Duke Tuesday afternoon. 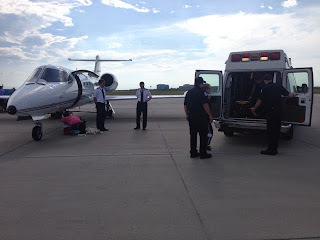 An ambulance picked my mom and I up at the hospital and drove us to the airport (we flew out of centennial airport not DIA) There we got on the med flight. It was a tiny little plane, there was a paper inside that I think told about the plane (I never read it) but it was for a learjet so I am guessing that was what we were on. It was not bad, I actually kind of preferred it to a regular flight. It was a breeze getting to it and on the flight, no waiting around at the airport and no annoying security. Plus since I was on a stretcher on the plane I got a great nap! No wedging up against the window for me! The flight took a little over 3 hours (same as a commercial flight). They told us this jet can fly just as high and as fast as commercial planes and it sure did. We got to Durham around 10. We landed at the regular airport here and were again taken via ambulance to the hospital. On the plane, the part you can't see had two seats one for my mom and the other for our stuff! Since I have been here it has been more of the same, waiting, for the most part. I had an endoscopy, where they look at your stomach, and biopsy done yesterday, a PET scan today and will hopefully get a bronch done tomorrow. The tests aren't too bad so far, except that my appetite has returned again, only they keep not letting me eat! Oh well it makes it that much better when I finally can. The plan is, as long as things are still going well, to release me from the hospital tomorrow since I don't really need to be taking up hospital space waiting for results. So now we just sit and wait around and we know how I do with that. Bronch results have been like a person waiting to see if they have cancer to me, oh wait that is exactly what we are waiting for this time and it doesn't really feel the same as waiting for bronch results. To tell you the truth, it is actually easier than waiting for bronch results. With a bronch they have no idea if you have rejection or not, it can only be identified under the microscope, there isn't a "rejection look" or other signs like there is with cancer. The docs here are fairly certain it is what I have and are really waiting to find out to what degree rather than if it is cancer or not. To be honest I am kind of hoping it is cancer, not because I want that don't get me wrong, but cancer would be an answer with a treatment plan, so I could move on. I would love it if the test shows some other definitive answer that is not cancer but is much simpler to treat, but the docs don't seem to have other ideas that are high up there in possibilities so I can't imagine what that might be. If the results are negative and don't show something else then who knows the barrage of testing I will have to go through to discover the source of my pain and why I had so little blood. Wow, Anna. Just... wow. We are thinking of you and your mom. Hopefully they can treat it by just scaling back on the anti-rejection meds! I'll be thinking of you and praying for you!